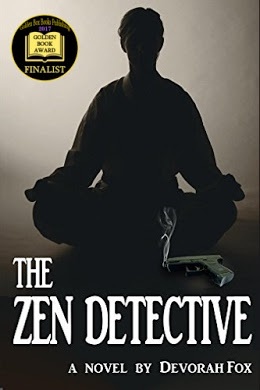 Finalists were announced in the Golden Book Awards contest and The Zen Detective is a finalist in the Thriller/Suspense/Mystery category. This is a two-pronged competition; a juried contest and a popularity vote. You can vote for The Zen Detective to win the Readers’ Choice. Voting is closing earlier than originally announced, so hurry. Saturday, Apr. 1 is the voting deadline. You don’t need to buy or register for anything. Just scroll down to the Thriller/Suspense/Mystery category and vote for The Zen Detective. Yours could be the deciding vote. This entry was posted in arts&crafts, read and tagged arts&crafts, mystery, read, thriller. Bookmark the permalink. Love thrillers. I’ll be checking out the book. Thank you. I’d love to hear what you think about it. Congrats Devorah and best of luck winning the award! Thank you. I’m so excited that the book was chosen as a Finalist. I love a good crime thriller. Must check out this book, Devorah. Thank you. I’d love to hear what you think. First a huge congrats & I voted for you! Thank you so much. I am very excited. Thank you so much. I was so pleased to have the book named a Finalist. Winning would be awesome. Congrats Devorah!! I’ve voted and best of luck winning! Thank you so much. People really enjoyed learning about your upcoming release, too.